We recently kicked off the 2012-2013 school year with a great start thanks to the high quality supplemental resources from Lakeshore Learning. I home educate my 2nd grader, kindergartner and pre-k student and there are a variety of excellent educational tools that we utilize in our classroom on a regular basis. Reinforcing math, reading, spelling, geography and other important skills can be fun and exciting with products from Lakeshore Learning. In fact, my children often ask to include games, hands-on activities and crafts from the Lakeshore Learning product line in our class and even in their own play time. My seven year old son has been asking if he can receive a weekly allowance. 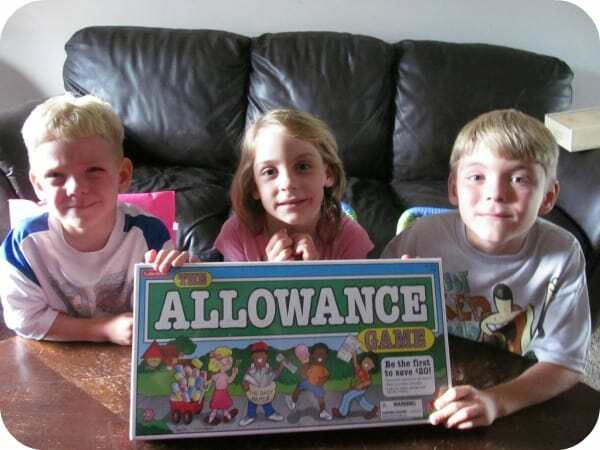 My husband and I find it important to teach our children the value of earning money through hard work so we were excited to discover The Allowance® Game ($16.95) from Lakeshore®. This game will help my children learn how to “save and spend their allowance”, “start their own business” and “learn how to change and handle money”. Recommended for ages five and up, my three children who are ages 7, 5 and 4 really love to play this game. I appreciate that while it is fun, they are also learning important lessons in fiscal responsibility, math skills etc. The brightly colored board and game money are appealing to young children and the game is very engaging. In fact, my eldest son is playing so well and learning so much that it may be time soon to give him some additional chores around the house so he can earn a real allowance! Every day in addition to our math book work, I like to include a hands-on math activity that helps to make math concepts “real” for my children and therefore less intimidating. Grab & Match Level Math Quickies Number Sense ($29.95), is a boxed set of 15 activities for ages 6 and up (note: my four and five year olds are able to do the lower leveled activities in this set). I love that I can select from 15 different grab & match games that are stored in their own pockets within the box to go along with our lesson of the day. There is even an activity guide with answer key and this set targets standards such as “represent objects with a numeral 0-120”, given a two-digit number, mentally find 10 more or 10 less” and “represent whole numbers as lengths on a number line”. Is your child or class getting ready to learn U.S. State and Capitals? If so, the U.S. State and Capitals Match-Ups ($14.95) is an excellent resource to help make learning geography skills fun and exciting. It includes 18 puzzles that have self-correcting pieces and my seven year old was so excited when he was able to match everything correctly and call out all 50 states and capitals. The puzzle pieces are sturdy and durable and I love how easily it stores away until the next use in its box. My son is a “builder” and a hands-on learner and spelling has so far been his one challenge in school that gets him very frustrated at times. 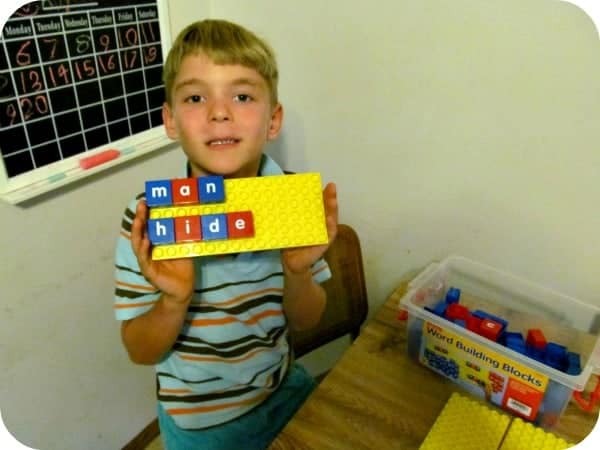 Introducing the Lakeshore Word Building Blocks ($29.99) has been monumental in building his spelling confidence and interest in “building words”. How does it work? This set includes 20 vowels and 58 consonants which are used to build words on 4 bases. In addition to building words, we practice sentence building and play games with the younger kids such as swapping out blocks to make new rhyming words. My three children have “played” with this set for over an hour at a time and frequently request it during their quiet time before bed in addition to when they use it during class time. 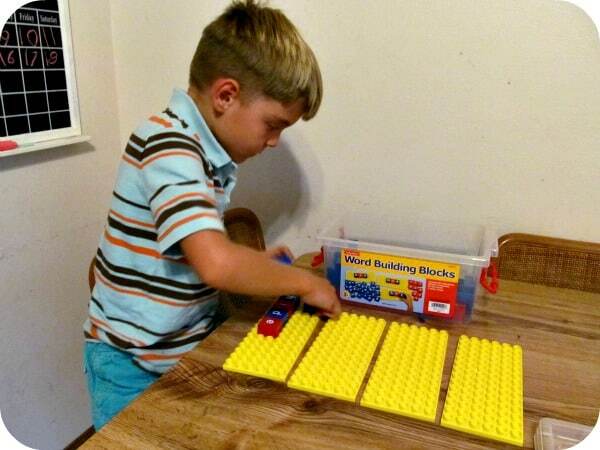 The Word Building Blocks set is an exceptional tool for my children in terms of enhancing their ability for blending phonemes and substituting phonemes to make new words. I am very excited to introduce you to some of my personal back-to-school favorite products from Lakeshore Learning. Lakeshore Learning products are available online at LakeshoreLearning.com and at 56 retail locations across the United States. You are invited to visit Lakeshore Learning to browse the entire selection of educational products or to purchase your favorites for back-to-school learning! I like the Magenetic Alphabet Maze. Chef Costume would be great! My kids would love the costumes- chef and police. The Washable Watercolor Brush Pens look very nice!